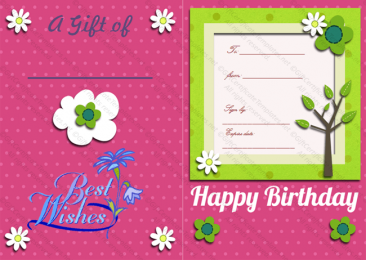 When it comes to gift giving time for a birthday it can be extremely difficult to decide what to get for your loved one, there are so many choices – but one thing you might not have considered is a gift certificate and if you get a gift certificate for your friend or family member then you should definitely use our free gift certificate templates. 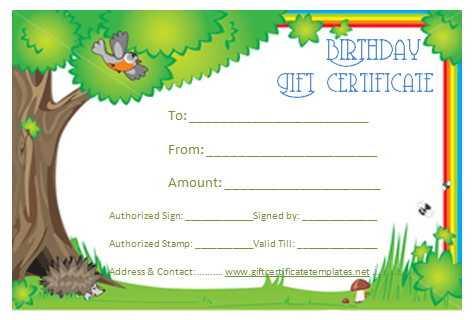 Our gift certificate templates are beautiful and ideal for any special occasion, especially great for birthdays. 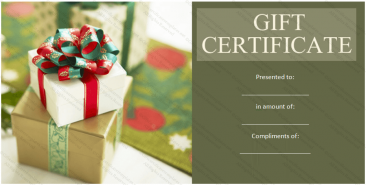 They will spice up any gift certificate gift – turning it from a fairly drab standard gift into something personalized and unique to the person you are giving it to. 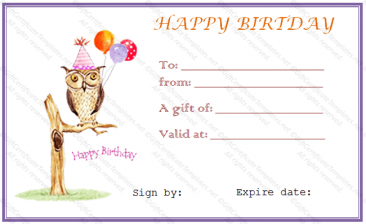 Not to mention that they are entirely free, they won’t cost you a penny – just log on and download. 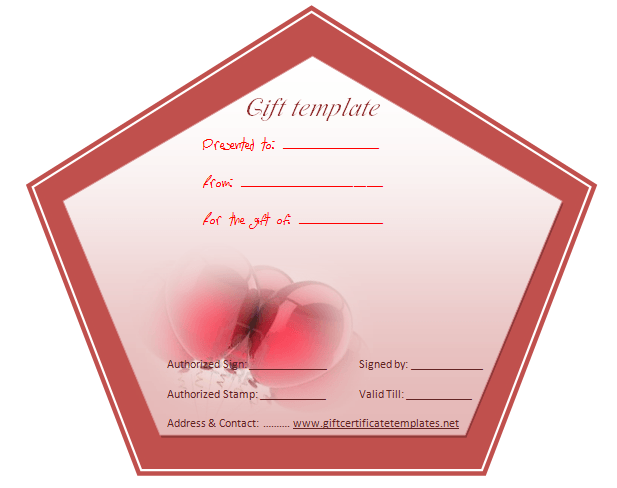 Getting a gift certificate template is easy too, you can download your gift certificate template with just one simple click – meaning that you don’t have to waste time getting it. 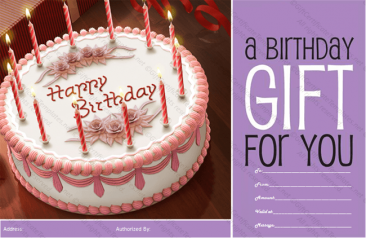 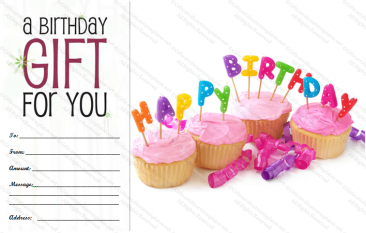 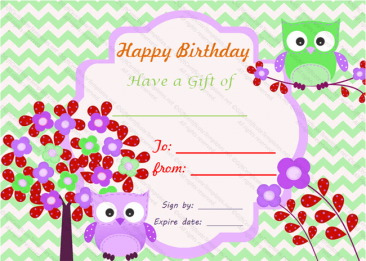 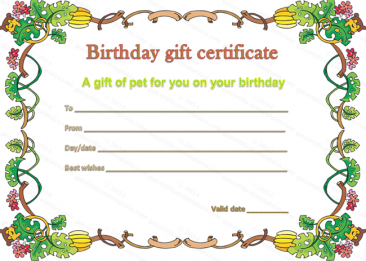 With many other gifts, you have to wait for delivery, then you might have a problem and have to send it back – this will never be a problem with our birthday gift certificate templates, one click and it is downloaded to your computer, ready to be printed. 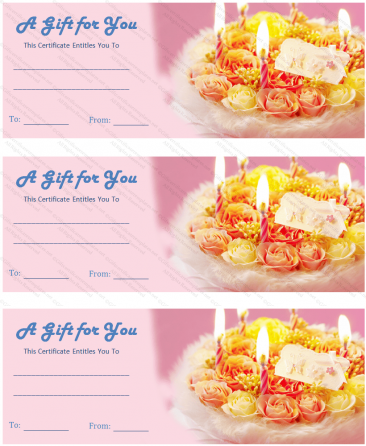 You can personalize your gift certificate template for your loved one too – making it unique no matter what the occasion. 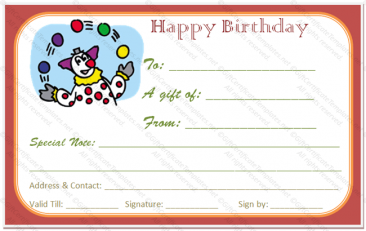 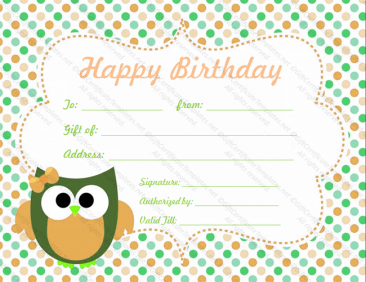 All of our templates are fully customizable, whatever the occasion – birthdays, Christmas or anything you can imagine you can customize our gift certificate templates to match. 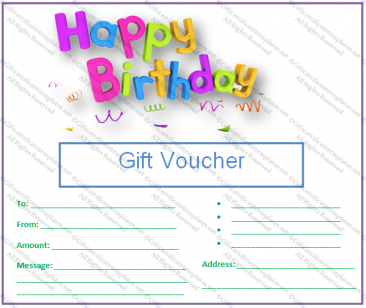 With regards specifically to a birthday gift certificate template we have that covered extremely well, we have many different ones to choose from too so whether it is for a boy or a girl, your mum or your dad or your boyfriend or girlfriend, we have the template ready to go. 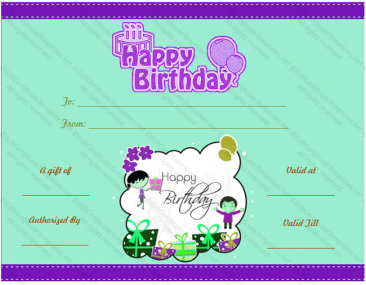 As I said above they are fully customizable, they are really easy to customize too – once you have downloaded them without easy 1 click download process, just open your gift certificate template up in Microsoft Word or other word processor that can open Microsoft Word files and every part of it can be edited, change the name, change the event or even change the template itself if you want to – maybe you like part of the template but think that a little bit would look better if you changed it, that is not a problem with our gift certificate templates. 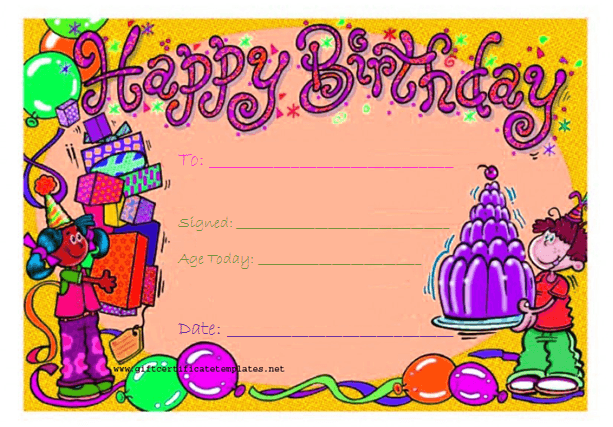 You can also easily edit the basic details – like name and date without any hassle at all. 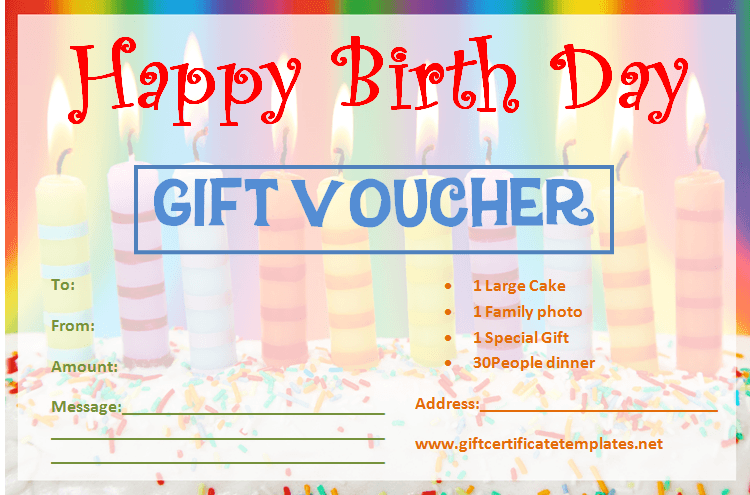 So whoever you are buying a birthday present for, consider getting our free gift certificate templates, they will add a touch of class to any birthday – be it for a friend or family member. 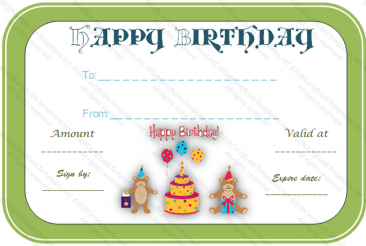 A gift certificate is the perfect birthday present for the person who is difficult to buy for, or the person you just don’t want to disappoint by buying them something they might not like and our absolutely, totally free gift certificate templates are the perfect choice every time.